Ordered a Carbonara Pasta for a work lunch the other day and I was highly disappointed. It was very bland and runny – when a carbonara should be thick and sticky. It was definitely nothing like this – the best carbonara I have tasted to date. 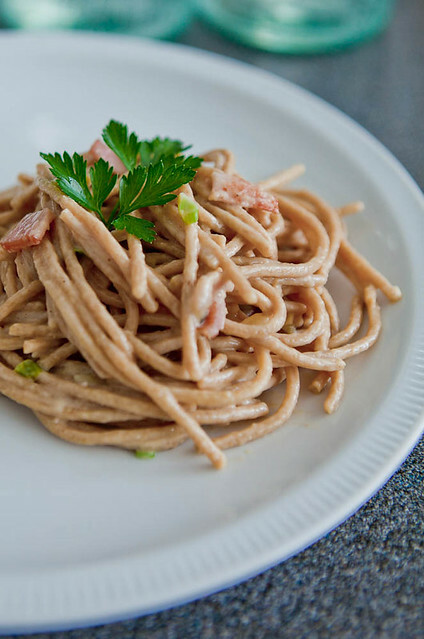 I used wholemeal spaghetti although I much prefer fettucine or linguine (Woolies didn’t stock them in wholemeal). I guess the texture isn’t as soft as white pasta, but that doesn’t bother me. I’ve gotten used to eating only wholemeal/wholegrain foods. I wont eat bread unless it’s wholemeal and wholegrain. This is definitely my boyfriend’s fault.